A very happy birthday to Nick who turned 25 today! Please check him out in our Rogues Gallery! Yesterday (July 8th) we spent the day in Tadoussac. We got up early because the boat was pretty cold! So, I did the laundry and got the fleece sheets out for the bed. The floor of the boat is really cold, so you always need slippers . We keep the fruit and vegetables under the floorboards near the fridge and for the first time since we’ve had the boat, they are the perfect temperature! The water temperature in Tadoussac is 8 degrees. A couple of funny things happened yesterday. Dennis was up early at 5:00 and wandered around. He could hear some snorting and huffing and wondered what it was. Well, he saw a big whale right in the harbour. Sadly though, he was unable to get a good picture of it but did spend some time searching the internet for pictures of killer whales and put them on his phone in order to fool me. It didn’t work. I went for a bike ride but only lasted an hour – the hills are wicked! Plus, there really wasn’t a lot of places to go as Tadoussac is in a giant gully surrounded by steep cliffs. We went shopping and then went to the interpretive center for whales. There, we learned all about the types of whales that are in the marine park. 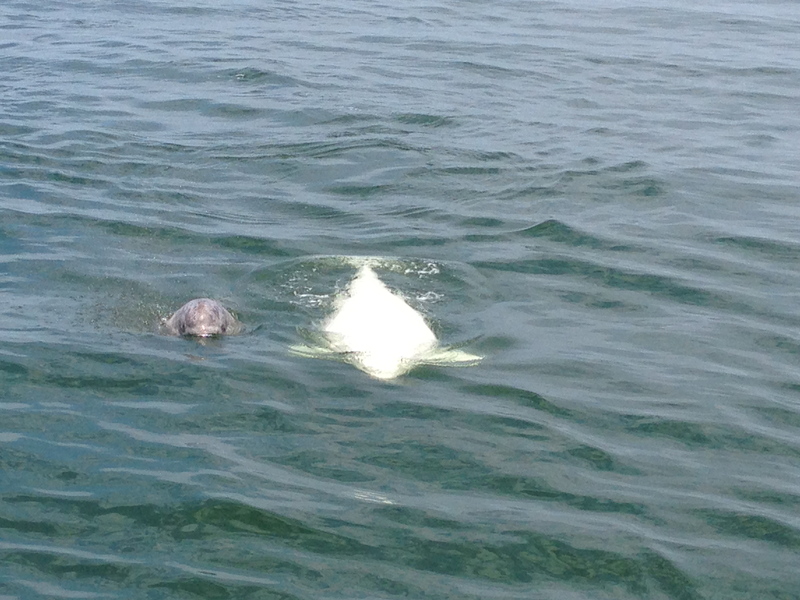 The guide told us that we might see belugas and that they were very curious and may come up to the boat. If that happened, we were to cut our engine so that we wouldn’t injure them. While we were at the interpretive center, we saw a man taking a picture of his wife facing the building. Meanwhile, there was a big whale right behind them, blowing water. We had a good laugh over that! We went out last night and heard a French band called The Travelling Fish (Les Poissons Voyageurs). They had two accordions, a guitar and a bass – they were pretty good. We didn’t stay out late though because we knew we had to leave early today so at 5:15 am, we set out. The water was very calm and we saw quite a few whales, porpoises and seals from a distance. At around 11:15 though, we spotted a beluga off the bow, so we slowed down and noticed that it had a young one with it (the babies are grey). They were quite near the boat so Dennis put the engine in neutral and we drifted towards them. They swam towards the boat and then popped their heads up right in front of us! We got pretty excited about this and within a few minutes, another one arrived. The three of them hung out right near the back of the boat, they could have been touching the rudder or the prop. Then, they dove away for a bit but kept coming back. We then spotted another one, so we had four swimming around the boat. The whales stayed with us for about half an hour while we drifted around. We counted seven in total – three babies and four adults. They definitely had distinctive scars on them and were very beautiful to watch. At one point, one of the babies rolled around on top of its mother a few times. 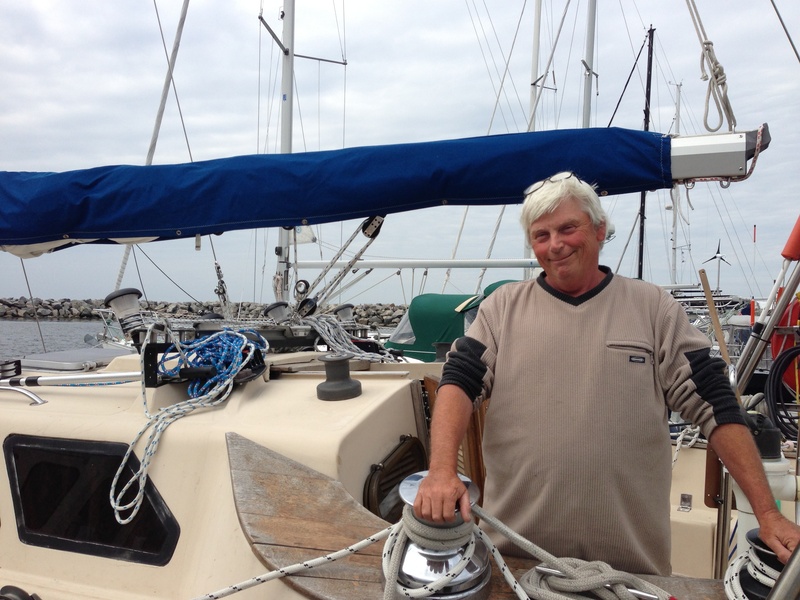 We had to pull out the sail because we didn’t dare use the engine but we were drifting back towards Tadoussac. Once we started moving, the whales started leaving and we watched them swim away. We made it to Rimouski at about 4:00 without any difficulty. The marina is very nice and everything is close by. We met up with Dale – he met Dennis while in Quebec City. Beautiful video. How incredible to be so close to those magnificent mammals. I notice that they pay about as much attention to Dennis’ commands as does his red-haired bride. Wear your beret next time, Dennis. That will get their attention. Am thoroughly enjoying your posts and am discovering new places vicariously. I’m a huge fan of Tadoussac Lautrec’s paintings, by the way. Town was no doubt named after him.